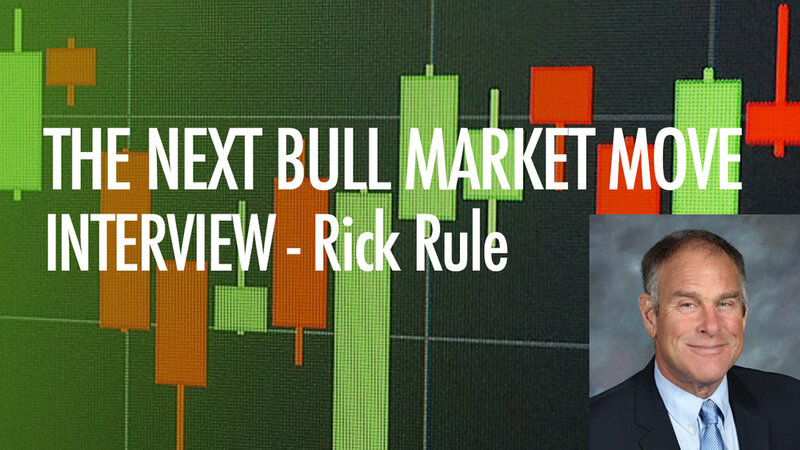 The Next Bull Market Move Interview - Rick Rule, President and CEO of Sprott U.S. Holdings Inc.
A couple of weeks ago I was lucky enough to catch up with Rick Rule while he was in London. We talked about the current sentiment within the uranium market, the bull markets in gold and silver, and how to become a better speculator within the resource space. On The Next Bull Market Move we have Rick Rule, here in London. How are you today Rick? I'm fine. Thank you for having me Kerem. Earlier we were talking about the recent Mines and Money conference here in London, so how has the conference been for you this year? What's the sentiment like? I think the sentiment was quite muted, understanding that Mines and Money has all ranges of issuers, from the very largest to the very smallest. For the very smallest of issuers, these are very trying markets. The investor perception with regards to mining, among generalist investors at least, is nonexistent. Which means that for the smallest companies, they're literally facing survival issues, which tends to make them somewhat muted. London, of course, is facing some of its own issues. Brexit, the city, the financial services community, is wondering what employment levels and what revenue levels will look like. So I would say that the outlook at Mines and Money was appropriately cautious. For us, mining financiers, and in particular providers of credit for non-investment grade project lenders, this circumstance is pretty close to perfect. So from my own point of view, Mines and Money was a very fertile environment for what I do. But for the industry as a whole, I think the outlook is quite cautious. The last time we spoke was back in the summer and we talked about uranium, and back then the spot price of uranium was 23, 24, dollars a pound. Since then I’m sure many readers have seen the in-depth interview you gave on Palisade Radio about the uranium space - and now the spot price is heading closer to 30 dollars. What does this signal to you? Is it a trend that's going to accelerate? It is. Although I don't see the uranium price in the near term...to me the near term is 18 months...rising to a level that makes the uranium industry profitable again. Certainly, the move from 23 to 30 is hopeful in terms of sentiment. And it's a sign that the market is tightening. Many of the world's existing reactors go into a new fuel purchase cycle fairly soon. And it's pretty clear that they're going to have to get long term contracts, to the extent that they do, at a fairly substantial premium to spot, which I think will continue to firm the market. But I don't think that you eliminate the supply overhang in the near term until you've increased the pace of Japanese restarts. That not withstanding, markets are often anticipatory and we've noticed that specially constructed uranium portfolios in the last 18 months are up 45%, which relative to the performance of the junior mining industry as a whole is probably the best single performance in the space, with the possible exception of little tiny subsets of like battery metal portfolios or something. Very good. Let's move on to gold and silver. You participated in the last bull market for those metals. Are we eventually going to have a mania in this forgotten sector? My suspicion is that we will have a mania. But again, I don't think we'll have it any time soon. Global confidence in the US economy, in the US dollar remains very strong. And it's my personal opinion the single most important determinant of demand for physical gold is confidence in the US dollar. Right now liquidity in the United States is very very high, partially as a consequence of the tax cuts, partially as a consequence of some strength in the US dollar. While the US economy is relatively strong in an absolute sense, it's very, very strong in a relative sense. The US economy is doing well enough that the Fed has been able to tighten credit markets and raise the interest rates while major competing economies, the euros and China and Japan have not been able to do that. The consequence of that is that foreign capital is pouring into the United States at a tremendous rate. And that has both strengthened the US dollar but also strengthened the perception of the US dollar, which has been hard on gold. I think two things necessarily flow from that. The first is the realization that the US dollar is only relatively strong as opposed to absolutely strong. The second is that if you take the point of view that gold trade's counter to faith in the US dollar, as expressed by the US ten-year treasury rate, it's worthy to note that the US ten-year treasury's been in a 35 year bull market. And that bull market arithmetically is either over or closer to the end than it is to the beginning. If you follow that logic, both parts of the logic, which is to say that they trade conversely and that the bonds market is closer to the end than to the beginning, then gold's market is necessarily closer to the beginning than the end. That's narrative. The arithmetic goes like this: the debtor, that is the payor on the ten year bond, the commune if you will of the United States, federal, state, and local, on balance sheet and off balance sheet, owes two hundred trillion dollars ... not my number, the US government's number. At the same time, the federal reserve estimates that private household net worth in the United States is a hundred trillion dollars. Now, I'm not trying to say there aren't other assets in the United States owned by governments and things like that. But if you look at the primary security for the two hundred trillion dollars in obligations, it's the private wealth of Americans, which totals a hundred million dollars. And it's that paradox, the two hundred trillion dollars in liability, that I think ultimately makes people lose some faith in US Treasury securities and hence drives people to gold. One more piece of math that I'm gonna make your readers suffer through because I think math is ultimately what drives narrative. At the top of the last bull market in precious metals - physical precious metals and precious metal related equities and debt - comprised about eight and a half percentage of investible assets in the United States. So their market share of investible assets was eight and a half percent. The current figure is between a third and a half of one percent. So I'm not saying that gold is gonna win a war against the US dollar. I'm merely saying it's gonna lose less badly. And you'll see a reversion to mean. If you saw a reversion to mean, demand for precious metals and precious metals equities in the United States, the largest financial products market in the world, would somewhere between triple and quadruple, and that's what I think is going to happen. Very good. Let's move on to talk about your career as a speculator. At this stage in your career, do you find that you're still learning new things from the markets? And has anything surprised you recently? Any successful speculator is frenetically in pursuit of knowledge. To be a successful speculator you have to be more performance oriented than money oriented, frankly. You have to be a permanent student, and I am certainly that. Part of my success as a speculator still has to do with the fact that at 65 I'm relatively healthy and I can keep the pace. And certainly, we've seen surprises, surprises of many kind in the market despite the fact, as an example, in the mining industry that we've underinvested in exploration for 20 years, and certainly the pace of discovery has slowed down. There's a new generation of technology and a new generation of technologists in mining. And despite the dearth in exploration spending, we're starting to see some pretty good exploration results. That's a surprise. The strength of the US dollar I must say, although it hurts me to say it, as American, is also a surprise. I understand it in context. That is, that while the United States has troubles, which are apparent to me, the troubles in the United States are much less apparent than troubles other places. So I understand the difference between relative and absolute strength. That's a surprise. The pleasant surprise to me, I think, in the mining business has been the emergence of a group of people in the mining business in their late 20s, mid 30s, early 40s, but a really surprisingly talented group of people. That's been certainly the most pleasant surprise. In the last 18 months I began to be more active mentoring the young mining professionals, and in particular where I've been able to, younger women in mining. And I'm astonished by the quality of these young people. We've, as an industry, sort of been despairing of the fact that the leadership in the mining community was all folks like me, old white guys, been in the business 40, 45 years, approaching at least their sell by date, and wondering what would happen in the mining industry. And mercifully, the market provided. There's this wonderful crowd of young people who decidedly don't look like me, young, often female, often not Caucasian. And that's been a very, very pleasant circumstance and wonderful surprise. So what would you say signals the difference between people like Lukas Lundin, Eric Sprott, and you - as very successful entrepreneurs and speculators - when most people in the markets don't make any meaningful money? What would you say makes the difference between you guys and everyone else, generally speaking? Every successful entrepreneur and speculator that I know cares more about the process than they do the material reward. Lukas Lundin didn't set out to be a billionaire. His dad had done that. Lukas Lundin set out to make money for shareholders and discovered deposits that were lowest cost quartile worldwide. In other words, the reward, the thing that most people chase, came about as a consequence of what interested him. Another example would be Robert Friedland, serially successful. Robert Friedland doesn't talk about making money to buy a large boat. He doesn't talk about building a mansion. He talks about discovering the largest copper deposit in the world in Africa. So it's really a focus on creating utility for others that creates wealth for oneself. Let's briefly get your thoughts on the Nickel market. The nickel market I like a lot. The hype in the nickel market has to do with batteries. The reality in the nickel market has to do with stainless steel. Nickel is an essential component of the way we live, and it's been priced for years below the total cost of production. So my suspicion is that the nickel price goes up, or things like refrigerators, washing machines and automobiles, things that require high quality stainless steels, won't be around. And I think I know how this plays out. I, in particular, like the sulfide nickel business more than I like the lateritic nickel deposits that one would find, particularly in Philippines and Indonesia. The high quality sulfide nickel deposits are rare. And in returning or robust nickel markets they make staggering amounts of money. As a final question, what is Sprott Inc up to at the moment? Can you give our readers an update on that? Well, the thing that's amusing me the most right now is we're fundraising for our second institutional lending fund. Many of your listeners will know that we are leaders in the provision of construction and project finance for mining projects around the world. We're in the process now of launching the second fund, a billion dollar US fund, that will have a London listed investment trust as a sidecar. We felt for years at Sprott that you can't be a global mining finance house and not have a presence in London. And I serviced London for 40 years with a suitcase. We don't want to be suitcase bankers in London, we want a London presence and we want a London listed presence. So for the last three weeks I've been wandering around talking to the big London mining financiers about assisting us with a London listed investment trust. I must say mercifully it's going quite well. Thank you very much Rick. And we'll have you on the show again soon. Always a pleasure, thank you.